PI Labs Turns the Ducky into Smart Digital Ducky - but should they have? Here is a great story from AP's Yuri Kageyama from Japan about our beloved Rubber Ducky who just went digital. 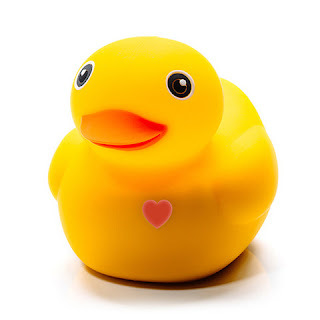 I don't know how many regular Rubber ducky's have been sold but Sculptor Peter Ganine reproduced his sculpture as a floating toy way back when, of which over 50,000,000 were sold. It brings up a great question - should all toys be updated? Check out Yuri's story. TOKYO (AP) — The iconic rubber duck has gone digital — but maybe it doesn't need to. Billed as the world's first "smart duck," the $100 Edwin the Duck is yellow, cute and waterproof, just like the good old rubber ducky floating in many bathtubs for generations. But Edwin also reads and plays music. He quacks, rather than squeaks like the traditional ducky, thanks to internal electronics. Motion sensors turn Edwin into a controller for games. Yet Edwin feels like a work in progress, a collection of miscellaneous functions that are mildly duck-related, without the features that would truly make him smart. For instance, he doesn't converse with kids using computer-generated responses, as other smart toys do. And most of his wizardry merely directs a child's attention right back to screens. Perhaps Edwin would have worked better without trying to be all that smart. Not every toy needs to be a smart toy. A good personality might be all that a digital rubber duck needs. Edwin does have a personality — and more. You can have Edwin tell a story or play a song by launching a free iPhone or Android app. The fun part comes through Edwin's built-in motion sensors. As your kid shakes, turns or moves Edwin up and down, an animated Edwin on the app swims or flies, or selects a response in a game or quiz. Tap on Edwin's wing, and a light in his head turns on. Edwin becomes a night light — but one that can also tell a child a bedtime story or play a lullaby. Two children asked to play with Edwin appeared to enjoy squeezing Edwin's soft head, just for fun, as that was not designed to control anything digitally. They also liked moving the toy energetically to make an on-screen duck swim in a race. But one of them remarked that he wanted Edwin to read a different story. The selection is still limited. Of course, the reading capability begs the question of whether parents ought to be reading to their kids directly instead. And should parents give kids yet another screen to stare at for these ducky games and quizzes? Stevanne Auerbach, author of "Dr. Toy's Smart Play Smart Toys: How to Select and Use the Best Toys & Games," says children need to run around, do finger-painting, read old-fashioned books and interact with nature. "I don't think you want to throw the rubber duck out and replace it with Edwin," Auerbach says. But she isn't dismissing Edwin entirely and says there could be room for both. She also says Edwin might be a hit with adults as a night light that can play music. For now, Edwin ducks concerns about privacy and security , mostly because he doesn't have Internet-enabled conversation capabilities, the way rival smart toys such as Mattel's Hello Barbie have. Edwin, derived from the Old English world for "friend," is available in the U.S. and Europe. Edwin's creator, Pi Lab, says it's in talks to bring it to Japan. Don Inmon, Pi Lab's co-founder, acknowledges that Edwin isn't the perfect duck yet and says more educational features are coming, including foreign-language instruction. He says casting a duck to house the technology was critical in giving an emotional element — a personality — as evident in Edwin's face design and tactile feel. Perhaps Pi Lab could just stop there. Charlotte Lee, recognized by Guinness World Records for her collection of more than 7,000 rubber ducks, plans to buy Edwin, but says her favorites are the silly, wacky and not very serious. In trying to be more, Edwin could be too smart to be truly playful.